I had reviewed some L’Oreal Revitalift the other day and mentioned that I would be moving on to other products. Today I want to tell you about those products! With it getting colder and colder out every day, I felt like it was a good time to move to some skincare that I already know I LOVE and have used before, as well as try out some other fancy products. 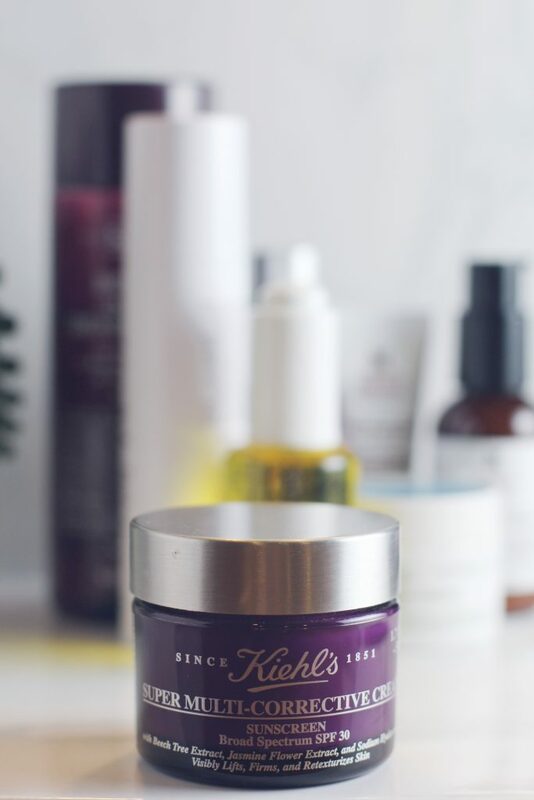 The stuff I want to tell you about today is all by Kiehl’s! 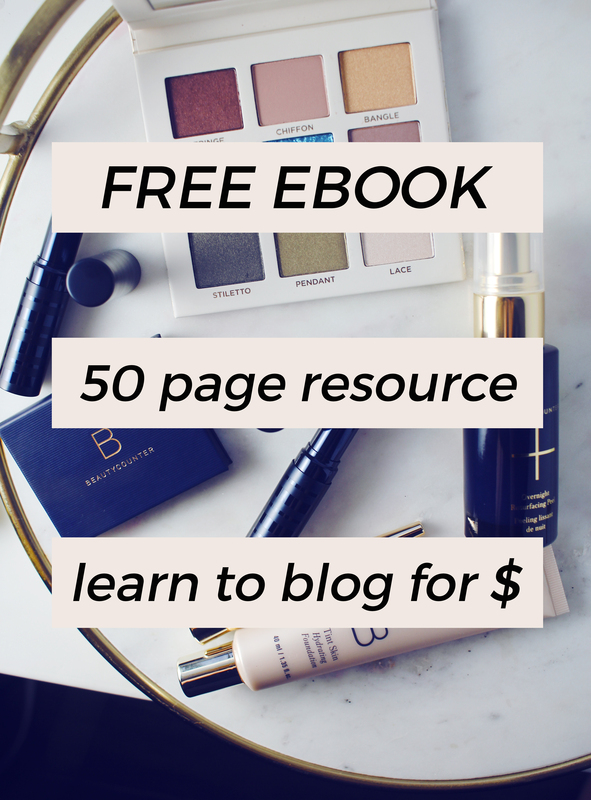 I have loved this brand for a few years now so I knew that when I was revising my skincare routine for a new season, their products would be a good place to start. 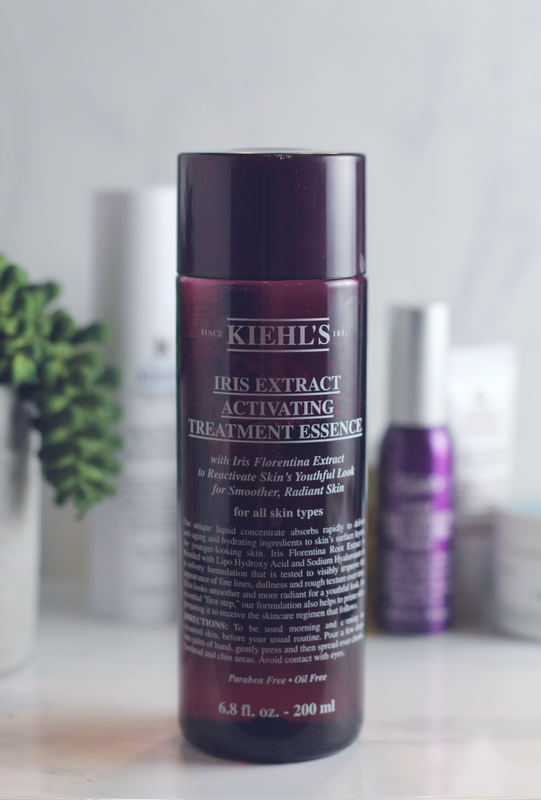 I wrote about the Iris Extract Activating Treatment Essence (review/buy) a few months ago, but it’s still in regular rotation in my skincare routine. I always give it a good shake before I apply it, and I use it morning and night! I feel it helps with my skin’s moisture balance before I add any skincare on top. It’s a great first step and unless I’m really sleepy/lazy I don’t skip it! My next step is serums. I use three of them! It might sound crazy but hear me out because I think they’re all doing something to help my skin stay hydrated, soft, and youthful. Hydro-Plumping Re-Texturizing Serum Concentrate is a must have. This is the first serum I use in my routine morning and night. I’ve reviewed it before (review/buy) and this is not my first bottle of the stuff! I think it’s a must as we approach winter to intensively hydrate as deep into the skin’s surface layers as we can get, which is exactly what this stuff does. At night, I am using the Powerful-Strength Line-Reducing Concentrate. I’ve reviewed this stuff before as well and this is not my first bottle! This is one of my all time favorite skincare serums. I say that because I can see and feel an almost immediate difference in the texture of my skin after I apply this. There is a warm, tingling sensation that accompanies this when I apply, and I can feel that my skin’s texture is being smoothed out. It has a primer like feel to my skin, where my pores look and feel like they’ve been blurred and filled in. One of the main ingredients is L-Absorbic Acid, also known as Pure Vitamin C. It’s an antioxidant known for its ability to improve the appearance of skin aging. It’s quite powerful! Kiehl’s offers auto-ship on their website and I’ve considered having a bottle of this mailed to me automatically every couple months. That’s how much I love it! 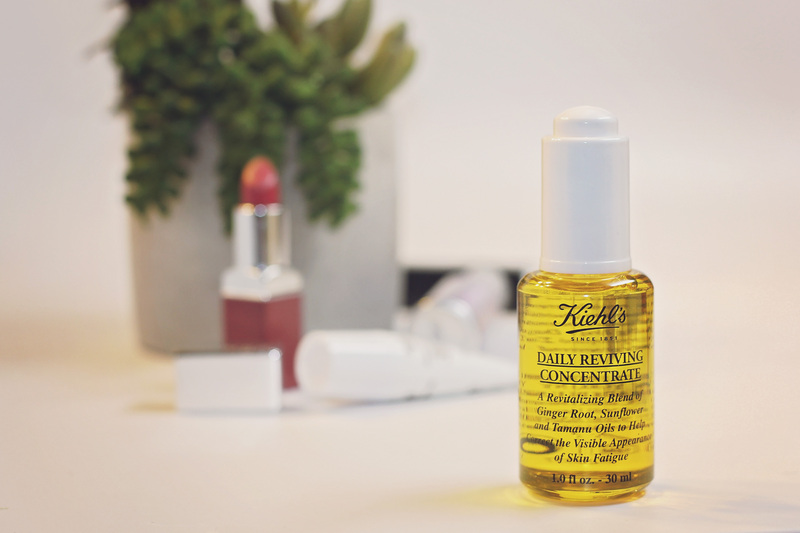 During the day, I am using Daily Reviving Concentrate. This is a newer product from Kiehl’s. I will sometimes use this during the day as well but I don’t always have time to wait for layers of skincare to dry before putting my makeup on. This is a super lightweight oil that is not at all greasy and really freshens up my skin. It has a slight citrus scent and the feeling is very similar to Midnight Recovery Concentrate. Some of the main ingredients are Ginger Root, Sunflower, and Tamanu. It really makes a difference in the radiance of my complexion, and when I wear this it helps my makeup go on more smoothly! I’ve been pretty high maintenance about my eye care routine as well, instituting two serums and an eye cream. I know that sounds insane, but the closer I get to 30 (I’m 29.5) the more I start to think about how my eyes look. I’m doing ok right now but have some minor fine lines that are only apparent when I smile. I also suffer from dark circles because, motherhood. The first thing that I’ve been applying day and night is the Super Multi-Corrective Eye-Opening Serum. This is a pearly white serum that lifts, firms, smoothes, and hydrates. I specifically love how it seems to firm my under eye area. Like I said, I’m not super wrinkly there but I do like to give that area a little extra attention, even if it’s such a subtle difference that I am the only one who notices. Next, I’ve been using the Creamy Eye Treatment with Avocado (review/buy). I have been using this consistently for a few months now and I am impressed by how much it hydrates under my eyes. They are so much softer now. My under eye concealer applies so much more nicely when I use an eye cream. What is unique about this formula is that there is almost a burst of hydration at the end while I’m rubbing it in. It starts off tacky, and as I’m rubbing it in, it turns into more of a watery texture and then sinks right in. I love it! My last step that I do in the daytime is mix my concealer with Line-Reducing Eye-Brightening Concentrate. I know that it’s not really meant for that, but I swear my under eye area never looks better than when I do that. The consistency is similar to that of the matching serum that I mentioned above. Because the texture is so smoothing and like a primer, it makes it so my under eye concealer doesn’t crease at all. I love this stuff! Of course you also need your SPF for day, which I’m getting from the Super Multi-Corrective Cream Sunscreen Broad Spectrum SPF 30. Phew, that’s a mouthful. I’ve tried the non-sunscreen version (review/buy) and loved that one as well. This is a thick cream that hydrates well and a little goes a long way. I’m really enjoying it for daytime wear! I didn’t mention a night cream but that doesn’t mean I’m not using one. Currently, I am rotating a few different options to use up what’s left of a few moisturizers that I had laying around. If you’re curious, I’m using up this one by Clinique, this one by Elizabeth Arden, and this one by Kiehl’s. Pretty soon, I’ll be cracking the packaging on a brand new one! But in the meantime, I’m going to enjoy how soft and fabulous my face feels with all this Kiehl’s goodness! So that concludes what I’m currently using. I think these are all really solid products and you can’t go wrong with a single one. Some of my friends wonder why I put so much time and effort and money into my skincare. I mean, I’m not even 30 yet! My answer is simple. While my skin looks fine right now, it’s because of the way I treat it and I want it to stay that way. Because I’m so busy raising kids, blogging, and just doing life, I don’t always wear makeup so I’d like to put my best face forward. 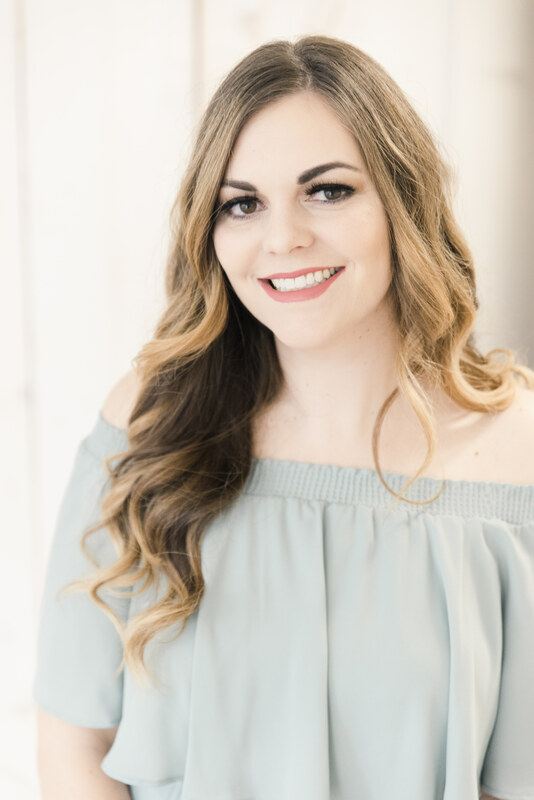 Using quality skincare allows me to feel confident in the skin I’m in whether I’m wearing a full face of makeup or going bare faced for the day! It’s one of the few things I’m able to do to pamper myself, and I am just glad it’s a great investment into my long term skin health. Loving these products right now! What are you using? Have you switched up your skincare routine for fall yet? 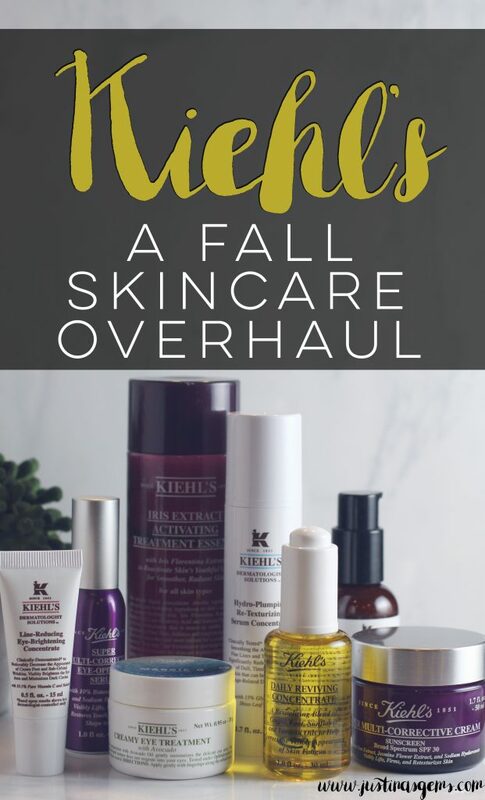 I love Kiehls skincare, I need to try more it some of these products I haven’t tried yet! I’ll have to try the avocado eye treatment. It sounds great! The essence also sounds like a great addition to the fall/winter skin care routine. My husband is a huge Kiehls fan. He stole my day oil and night oil. I will show him these products. I would love to try this line, one day. 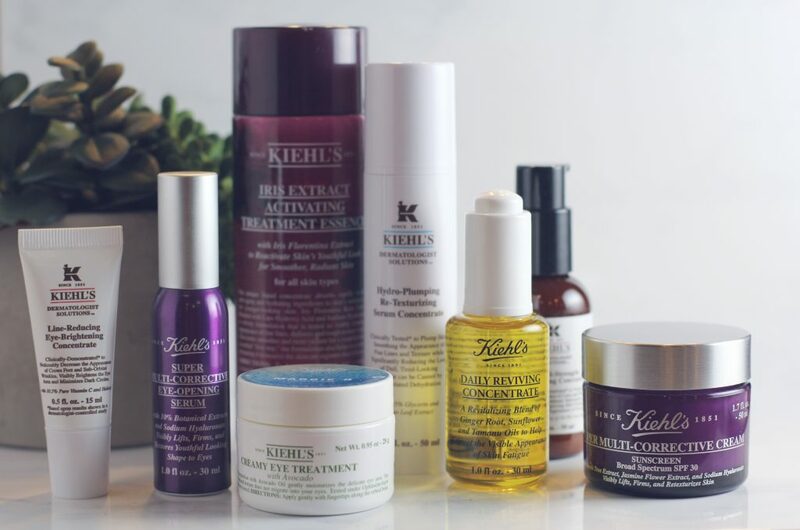 Ahhh, Kiehls! I always run back to their moisturizer. It’s amazing! 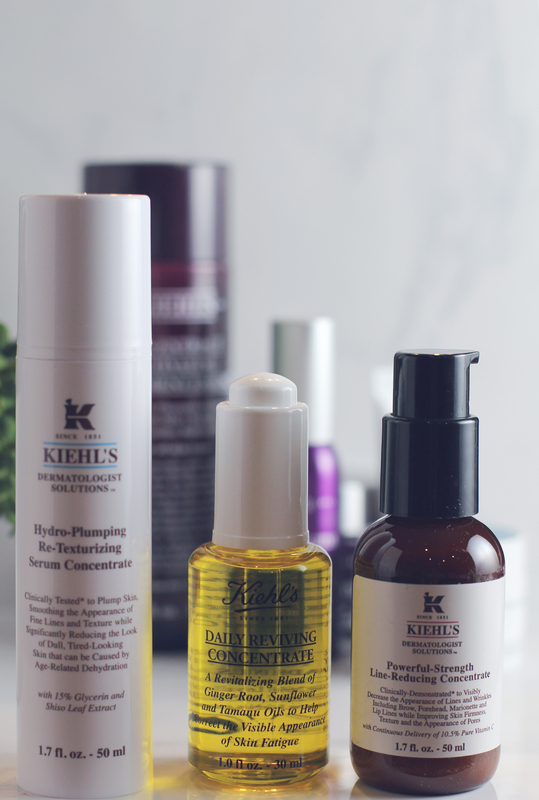 Kiehl’s has so many great products! This is such a great line. I love the selection of products you have from them. 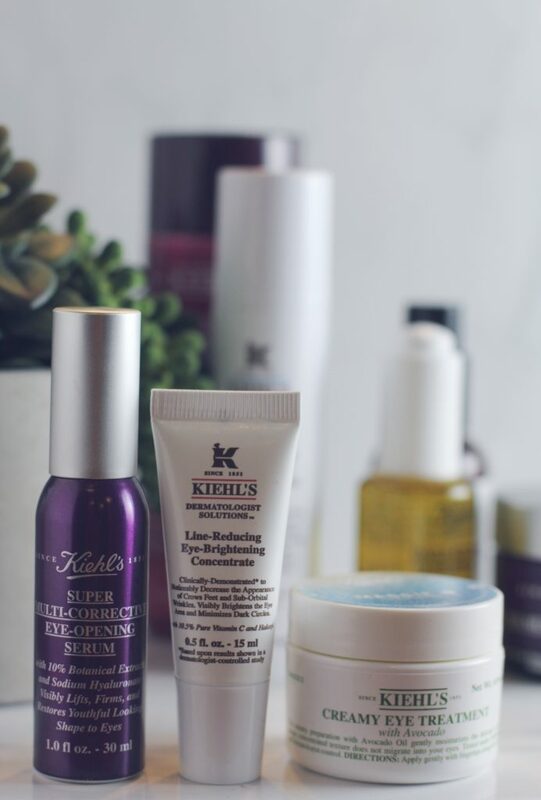 We are big fans of Kiehl’s in my house. My Fiance uses the men’s lines and loves it. The treatment essence is the next item I want to try from them. I just bought the Line Reducing Eye Brightening Concentrate. I will try mixing it with my concealer – thanks for the tip! I have heard such great things about this brand – Need to try them out! My sister is loyal to Kiehl’s and almost never uses anything else. What a fabulous post! I actually only have their Rare Earth cleanser + toner, and some hair care. This oil sounds divine though! I need that eye treatment! Great post! This might be the only brand I haven’t tried! Sounds so good though.